Directions: From Interstate 64 at Exit 133 (Farmers – Sharkey), go south on Rt. 801 to the junction with US-60. Then left (east) about one-half mile on US-60. Barn is at left. Notes: The Quilt Square is based on an actual quilt owned by Anne Bullock of Lexington, KY. Her grandmother, Margaret Pelkey Carter Morse, who lived in Vermont, made the bed quilt. Margaret raised 11 children by herself, and she was considered a champion quilt maker. During the later years of her life, she made more than 100 bed quilts, of which one was given to each of her children. They even purchased more. Anne had six of her grandmother’s quilts, and she allowed each of her five children to choose the one they wanted to keep. Feathered Star, made before 1940, is the one that was left for Anne to keep. 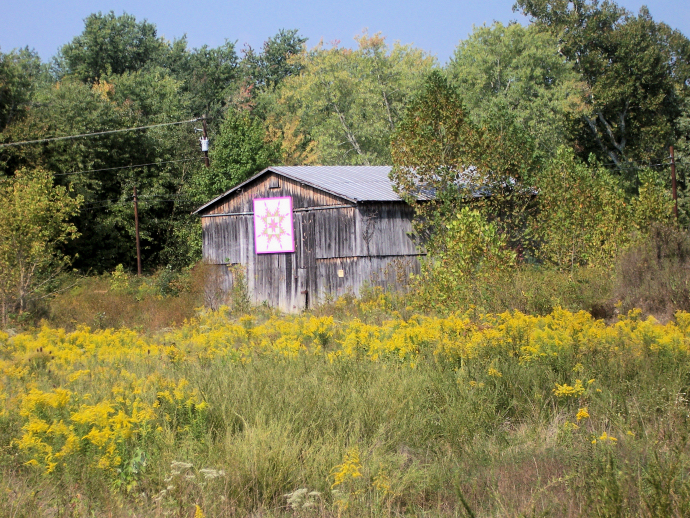 It was her desire to have painted and hung on her family’s barn at Farmers an 8’x 8’ quilt square patterned after her grandmother’s beautiful quilt.